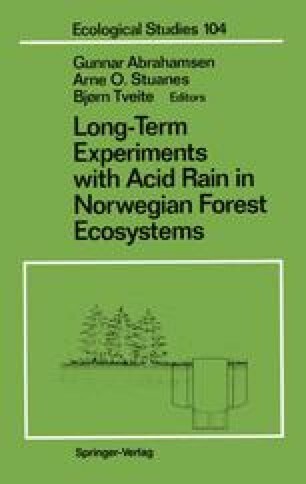 Most hypotheses on effects of acid precipitation on trees include effects on nutrient status. There may be direct effects by foliar leaching, imbalances in the nutrient supply due to increased loss of plant nutrients from soil or increased atmospheric supply of sulfur and nitrogen, or reduced uptake of nutrients due to toxic compounds in the soil. The studies reporated here are focused on the effects of experimental acidification by sulfuric acid added to groundwater. The artificial “rain” did not contain any extra N in excess of what was found in the groundwater. The experiments can therefore not answer questions about possible nutrient imbalances caused by increased N availability concurrent with reduced availability of other nutrients.